I will close with the highest 'praise' the old Quakers ever used when someone spoke or did well they fixed him with a serene gaze and said 'Friend, thee has been used'. Words from The Seven Mountains of Thomas Merton by Michael Mott. Alex's so rewarding post is here, the Con Moto first movement of Edmund Rubbra's Fourth Symphony which it showcases is music to die for. Building classical music's viral loop - 1 is here and more on Rubbra here. 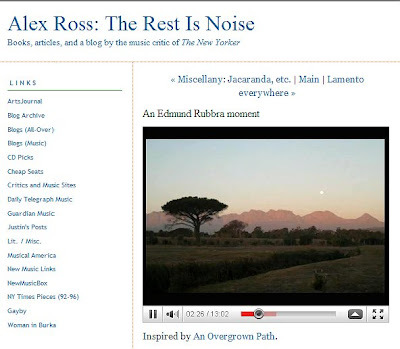 I'll confess, I'd never heard of Rubbra, but the vid posted on Alex's site really is majestic. Thanks for the heads up!